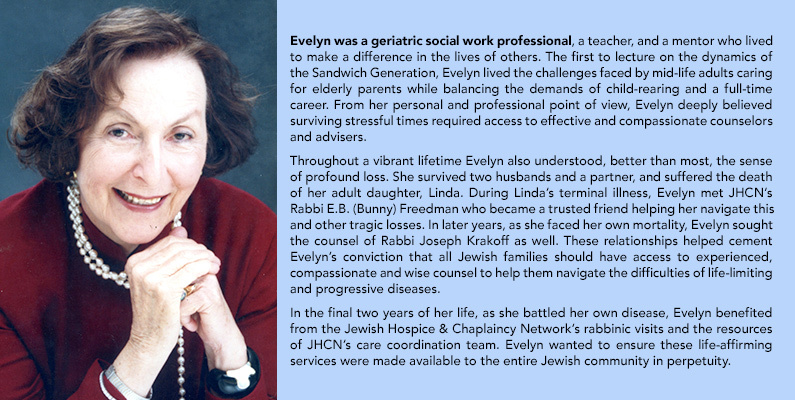 OVERVIEW The Evelyn Kasle Care Coordination team is at the core of the JHCN’s mission: to ensure No Jew Is Ever Alone when faced with life-limiting or terminal illness. From the first phone call received, our social workers, who comprise the care coordination team, assesses the needs of the patient and family, and together they create an action plan. SCOPE JHCN’s patient care coordinators are the navigators of JHCN’s mission. They communicate, plan, and act to ensure every patient and family member receives the care and attention they deserve. Our patient care coordinators watch over an average of 180 patients daily, or approximately 500 individuals per year. They also assist thousands of these patients’ family members. They field as many as ten thousand calls annually, seeking guidance, advocacy, and recommendations — and often emergency calls requiring immediate action. 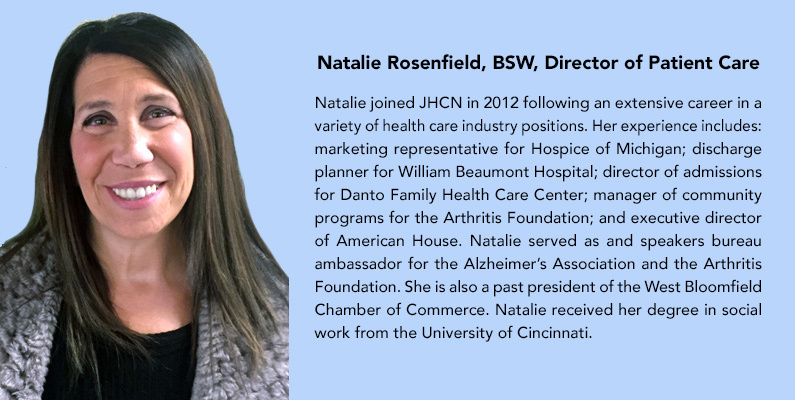 Our social workers are in continuous communication with caregivers, rabbis, community agencies, medical professionals, enrichment specialists, and volunteers to ensure every Jewish patient receives the best care possible. By advocating, educating, and navigating this last chapter of a patient’s life our patient care coordinators ensure no patient seeking our help ever feels alone. • Spiritual Care – Work closely with JHCN’s rabbinic team to create a supportive presence, regardless of level of observance or affiliation. If the patient wishes, they also coordinate spiritual care with the patient’s own rabbi. • Family Dynamics – Assist family members in sorting out the complexities and stresses surrounding life-limiting illness, including caregiving roles, responsibilities, and relationships. • Palliative Care Partners – Communicate and coordinate care with palliative caregiving providers, visiting nurses and others who make home visits. 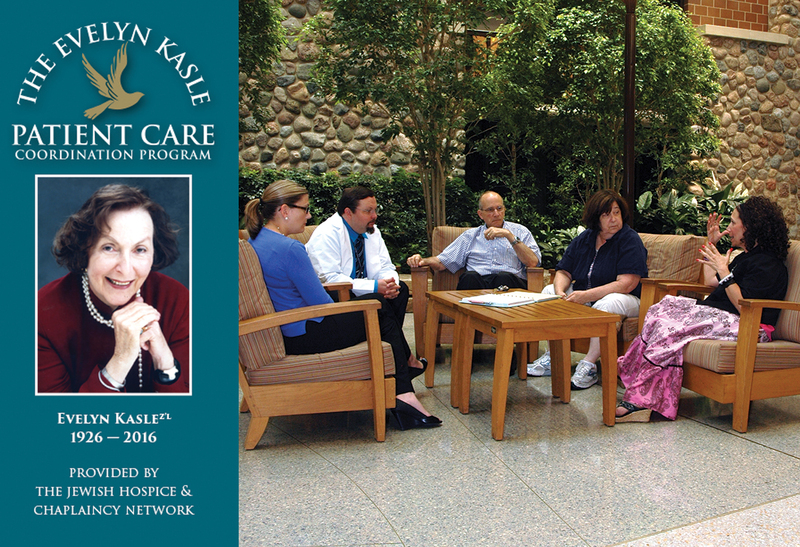 • Hospice Partners – Work with area hospices to essentially makes every hospice a Jewish hospice. They communicate with hospice agencies and advocate patient’s needs. • Visiting Physicians – Establish visits by physicians to frail patients’ homes to help avoid the stresses and risks of traveling to a doctor’s office or emergency room. • Pain & Symptom Management – Maintain relationships and recommend patients to physicians and nurse practitioners specializing in pain and symptom management. • Private Duty and Skilled Home Care Help – Help decision-makers identify the skills and competencies needed when assessing in-home caregivers so the family can make an appropriate private-duty or skilled-care hiring decision based on a patient’s needs and condition. • Housing Needs – Assist patients in finding appropriate housing including assisted living, nursing home, adult foster care, etc. – Legacy projects – including oral and video histories, printed memory books, etc. • Emergency Funding Guidance – Advocate for patients in financial distress who require medical and other emergency interventions. – Durable Medical Equipment — delivery and support of equipment such as walkers, hospital beds, oxygen supplies, etc. • Transportation – Recommend service providers to patients who no longer drive, lack access to transportation, or require a special vehicle for wheel chair assistance. • Jewish Community and Other Resources – Coordinate with area social service agencies, such as meals on wheels, adult day memory programs, etc. • Healthcare and Jewish Education Outreach — Training for medical practices, senior housing, nursing homes, hospitals, hospices, and social service agencies providing information, education and in-service training on best practices and cultural sensitivity for serving Jewish populations, and the Jewish perspective on end of life. This makes it significantly easier for healthcare and social service professionals to provide sensitive, quality service to Jewish patients and family members. • Jewish Community Education — Meet with synagogue leadership, community leaders and Jewish community affinity groups. Outreach includes providing information on how to get members the best care possible, even though they may not need JHCN’s support. • Caring For the Caregiver Assistance – Facilitate visits from experienced “navigators” to family caregivers, at no cost, to help alleviate caregiver stress. • Volunteers – Provide trained and dedicated Jewish volunteers. These caring individuals complement the professional care rendered by a patient’s health care providers and enhance a Jewish presence. until our services are no longer needed.